Dr. David Albin has performed 10,000 inguinal hernia surgeries and has over 25 years of experience. He is the Hernia Specialist. An inguinal hernia, more commonly referred to as a “groin hernia,” is by far the most common type. An inguinal hernia occurs when there is a tear in the abdominal wall muscles, which results in a bulge. This bulge consists of the intestines and fatty tissue. An inguinal hernia is typically more visible when straining or coughing. It may also disappear when you are lying down. Diagnosis of an inguinal hernia often depends on medical history. In most cases no X-rays or tests are needed to diagnose a hernia, other than a basic physical examination. Sudden or repetitive lifting or pushing. Constipation, coughing and difficulty with urination. A congenital condition, present at birth. 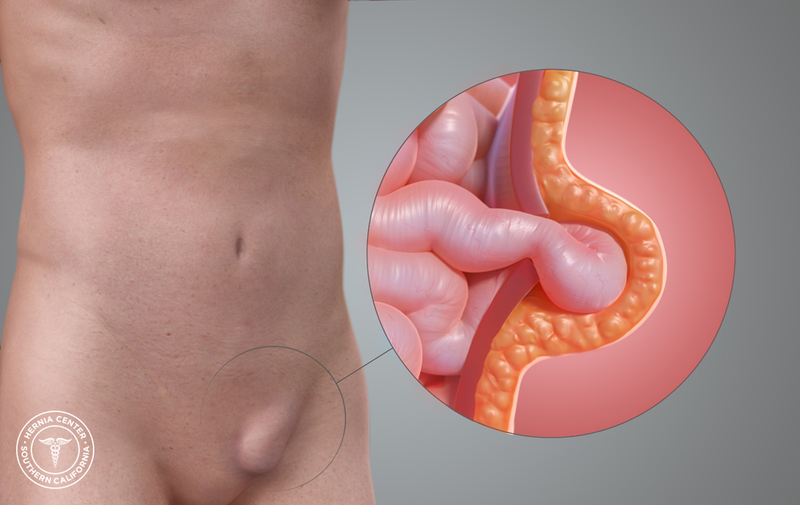 The symptoms of an inguinal hernia vary. The most common inguinal hernia symptom is the presence of a painful bulge in the groin area. Typically, inguinal hernias progressively increase in size and grow increasingly more uncomfortable with the passage of time. When no bulge is visible, mild groin pain is usually present. However, some patients experience no hernia pain or groin pain at all. When the hernia becomes increasingly painful or stuck, it may be strangulated. If this occurs seek medical attention as soon as possible. Inguinal hernias do not heal independently or “just go away.” Likewise, they cannot be fixed with diet, or exercise, or physical therapy. And be aware of the false claims you see on the Internet – there are no pills you can take to make any hernia go away. The only course of action for treatment of an inguinal hernia is inguinal hernia surgery. At the Hernia Center of Southern California we perform state-of-the-art techniques in hernia repair, with the inguinal hernia being the most prevalent. We have successfully preformed over 10,000 “tension-free” inguinal hernia repairs resulting in the lowest rates of post­operative pain, post-op problems, and recurrence. The Tension-Free Albin Technique, developed over a period of 20 years, is the most highly developed form of mesh hernia repair. The tension-free technique ensures that each patient receives specialized care that caters to the individual’s needs, rather than a “one size fits all” hernia repair. Each hernia repair surgery will vary based on the individual patient’s size, physical activity level, and work situation. Inguinal hernia surgery is generally performed under a local anesthesia with sedation. Typically, patients are allowed to return home the same day, often requiring little or no medication. Anesthesia is catered to each patient’s individual needs; however, many patients are allowed to choose their preferred anesthesia method. Local anesthesia, which allows a patient to be conscious throughout the full course of inguinal hernia repair, provides the patient with the unique opportunity to witness his or her own inguinal hernia surgery, wide-awake. Patients travel to us, worldwide, because we are one of few hernia centers to provide this experience. Ninety-percent of our patients choose local anesthesia with sedation. This method involves a local anesthetic in addition to an intravenous medication for pain and relaxation prior to inguinal hernia surgery. This method, our most popular, is optimal due to speedy recovery and minimal side effects. General anesthesia is for patients who want to be asleep during the entire inguinal hernia operation. General anesthesia is often necessary for major, more complicated hernia surgeries. At the Hernia Center of Southern California, all patients receive a local anesthetic that last from four-to-six hours. With this form of anesthesia, patients experience no immediate post-operative pain. The recovery period is approximately one hour after inguinal hernia repair. Patients are discharged the same day the inguinal hernia surgery is performed with a prescription for pain pills. Most patients will require only over-the-counter pain pills. All patients are given a post-op instruction sheet to take home with them and follow. Patients will be able to return to their normal daily activities, including driving, within a couple of days of inguinal hernia surgery. Dr. Albin is a well-recognized expert in inguinal hernia repair. The Hernia Center of Southern California specializes in all types of advanced open and laparoscopic hernia surgery. Dr. Albin has performed over 12,500 hernia surgeries in 25 years. His surgical practice is limited to the diagnosis and treatment of hernias. He is truly the hernia specialist. Patients see Dr. Albin from Los Angeles, Orange County, Riverside, San Bernardino and San Diego Counties as well as throughout the United States. The Albin Tension Free Mesh Technique is recognized worldwide.